A romantic and lovely landscapes encourage tourists to come and experience the romance of Nami Island. 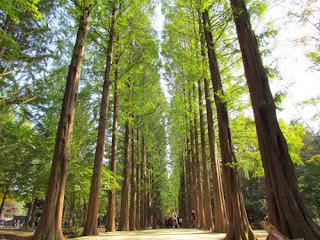 Nami Island become one of the very popular tourist destination by domestic or foreign tourists in South Korea. This island is very beautiful with the natural charm of the painting that looks very elegant. Not infrequently this tiny island has always provided a romantic atmosphere. 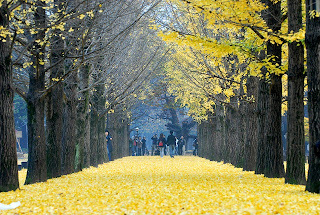 Nami Island is a place where human romance and natural beauty converge in each different season. To reach the Nami island visitors must use the ferry with a long journey about 5 minutes. Furthermore, "Welcome in Namira Republic" a phrase that you will see when they arrive on the island. This location is actually not a republic or a country, just managing to make the island is like a country. For example, such as where the purchase of tickets bearing the words "immigration" to describe anyone and from which you must pass through immigration in a way to buy tickets for 5000 Won. Presented by the romantic atmosphere of the island area of ​​460 000 square meters is not inexhaustible. At the fall, all the leaves from the trees turn into golden brown and fall to meet any existing road on the island. Artificial fountains that adorn every corner of this tiny island and the trees with different kinds, arranged neatly. Each type of tree is placed in accordance with the name of the street. One that you must know that every course has a beauty in a different time. There is a beautiful-looking Pine Street in the winter, beautiful Gingko Street in the fall, Jalan Sakura dazzling spring time, and do not miss Metasequoiq Road which is the object of photography enthusiasts. In addition, the uniqueness that characterizes the mainstay Nami is a touch of art through secondhand goods are recycled. Without prejudice to its aesthetic value, these items became increasingly ornate beautify the island in the middle of this Cheongpyeong Reservoir.